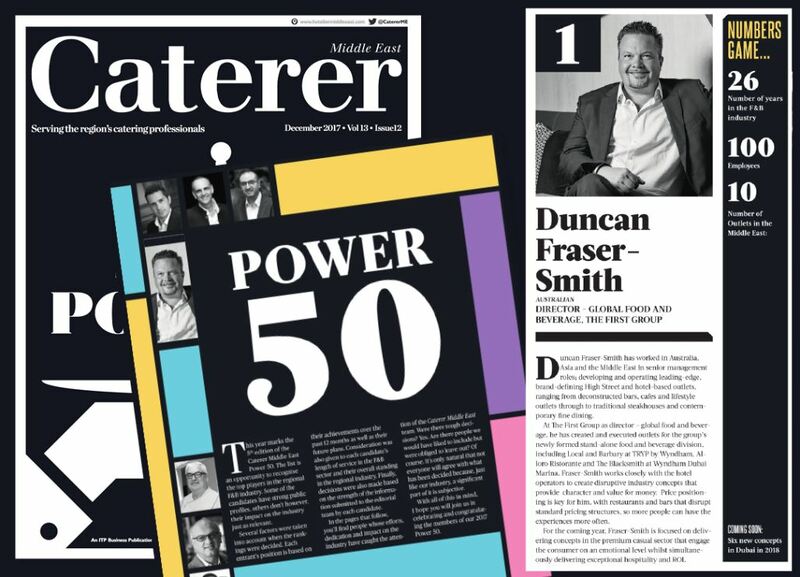 Duncan Fraser-Smith, the recently appointed director of The First Group’s (TFG) new dedicated Food & Beverage (F&B) division, has been named the top influencer in the Middle East F&B industry by respected publication Caterer Middle East. The accolade marks a significant professional achievement for the industry veteran who joined TFG earlier this year. In praising Fraser-Smith, Caterer Middle East cited his extensive experience in Australia, Asia and the Middle East, where he has developed and operated “leading-edge, brand-defining High Street and hotel-based outlets, ranging from deconstructed bars, cafes and lifestyle outlets through to traditional steakhouses and contemporary fine dining [restaurants]”. At TFG, Fraser-Smith is overseeing the introduction of a range of original and branded F&B brands to Dubai, which fill an existing gap in the market for affordable lifestyle-driven dining concepts. TFG’s F&B division aims to launch 30 new outlets in the coming years and will look to franchise its most successful brands thereafter. “We will work very closely with hotel owners and operators to create new concepts that meet market demand, managing all aspects of the operation, from idea conception and outlet design to staff recruitment and training,” said Fraser-Smith. We invite you to know more about TFG: the blooming hotel investment company in Dubai. Click here to know more about us. .